William and his Dad, Anthony, collected our Shropshire based Viking Valhalla at the end of July 2017. They look forward to riding local lanes and going out riding as a family. 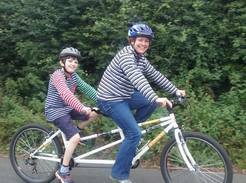 Isabella and her Mum, Lisa, collected our Lancashire based Dawes Duet tandem in late July 2017. Unfortunately they didn't ride it. 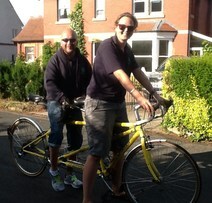 James and his wife collected our London based Wakefield tandem in late July 2017. More details and a photo are to follow. 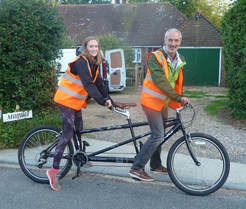 Darcy and her Dad collected one of our Sussex based tandems in late July 2017. They are going to ride it in the London Freeride. Charlie and his Mum, Emma, collected one of our Sussex based Viking Companion tandem in mid-July 2017. They borrowed one last year but didn't ride it much. Ray and Simon, his Son, and his Carer collected our Lancashire based Vikimg Companion in mid-July 2017. 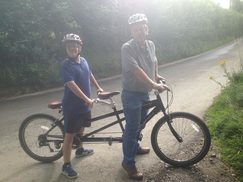 Our Helper David wrote, "Simon is an experienced tandem captain, riding with visually impaired stokers in Coventry, so he didn't require my usual training course! The photo shows Ray being helped onto the bike today, he now lives in a care home and hasn't ridden for some years; Ray has a very distinguished past as a racing cyclist. This is Ray in his pomp at HTTP://velocoach.co.uk"
Morgan and his Dad collected one of our Viking Valhalla tandems in mid-July 2017. His Mum, Nichola, posted a video of him riding it on our Facebook site, that day, and wrote that even though it was raining he wanted to ride it. Toby and his wife, Charlie, collected our London based Viking Saratoga in mid-July 2017. 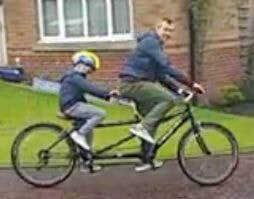 She wrote that week, "Please find attached a photo of Toby's first foray on the tandem that you have kindly lent him. 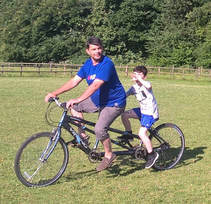 He is at the back of the bike, with his friend, who luckily is an experienced cyclist. 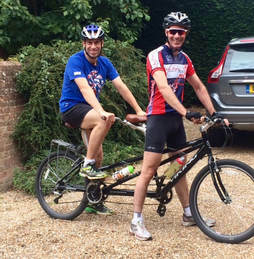 They are now in training for their ride from London to Paris in early September. They did a 50km ride yesterday, that went well, although Toby realised he needs to buy some Lycra cycling kit! 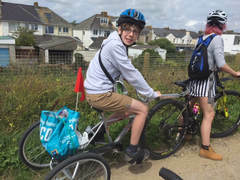 Due to Toby's Stargardts Macular Dystrophy he is partially sighted, so riding a bike solo to Paris would not be possible, but thanks to your brilliant charity and this bike you have lent us, it is! We will send you more photos and an update from the trip to Paris." And they did. You can see them on our Facebook site. John collected our Edinburgh Pennine Trail tandem in mid-July 2017. 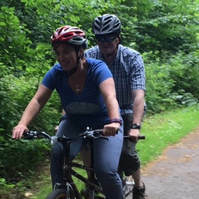 He wrote the same day, "Here is an action shot with Rachel who can hop onto the saddle as we set off and, as long as she tells me we are stopping, I can stabilise the bike while she gets off the saddle. Today was just a short ride to familiarise and get used to the bike. Now planning our first family ride in 2017 altogether, this coming Saturday." 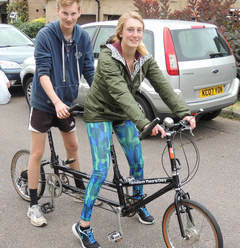 Johny and his sister, Ellie, collected our Hertfordshire based Tandem Two'sDay in mid-July 2017. She wrote that week, "We are getting on well with it and have already been on a few rides around St. Albans. My brother really enjoys it and it's nice to be able to take him out and involve him in something he couldn't usually do." Malachy and his parents collected our Shropshire based Viking Companion tandem in mid-July 2017. In late August, Di wrote, "Many thanks for getting us out and about on two wheels. On our way for a picnic and a play in the park." Harvey and his parents and brother collected our newly donated, Dursley based, Viking Companion in mid-July 2017. More details are to follow. Mark collected our Wiltshire based Viking Regency tandem in early July 2017. Mark said in mid-July, "We gave the bike a test run today and she got on fine. A little apprehensive due to her issues with balance but she found it absolutely OK and enjoyed it. We are planning on a longer ride tomorrow." Logan and his Mum, Amanda, collected our East Midlands based Mission Piggyback tag-along trike in early July. She wrote, "Logan is loving his bike and we have managed to get out and about much easier, so thank you so much for the loan." Tom and Pat collected our Shropshire based Dawes Super Galaxy Tandem in early 2017. 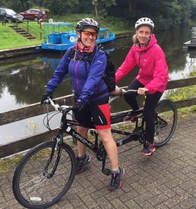 Anusha and her Mum, Laura, collected our Surrey based Viking Saratoga in early July 2018. lana wrote, "They have been incredibly positive about the benefits of borrowing the bike and have been doing a lot of riding as a family as she has two younger siblings". They didn't ride it much over the winter, but planned to ride it in the spring her Physio said that it would be good for her. 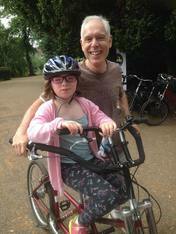 Jemimah and her Dad, Chris, collected our Shropshire based BuddyBike in early July 2017. See a video of them in action on our Facebook site. Sonny's Dad collected our Surrey based Viking Saratoga tandem at the start of July 2017. His Mum, Lisa, wrote, "Just practising at the moment, will send some more during the holidays. Great fun!" 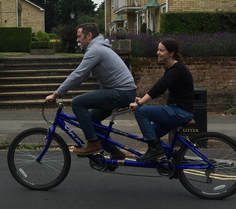 Chris and his colleague, Hannah, collected our Dursley based Co-Motion SkyCapp "Bouncy Bee" tandem at the start of July 2017. He wrote on our Facebook site a few days later, "We did our first ride yesterday and it was sooooo good". They plan to ride it on a Stroke Association ride. Cheryl collected one of our Edinburgh based Viking Valhalla tandems at the start of July 2017. She said, "We went from Kilsyth to Kirkintilloch: it was a bit wet but we enjoyed it. 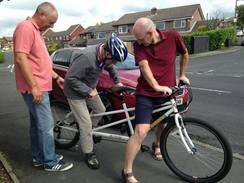 :)"
Willy and his friend, Alun, collected our South Yorkshire based Orbit tandem in early July 2017. 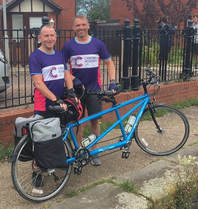 They tweeted a number of pictures from their ride along the Leeds to Liverpool Canal. 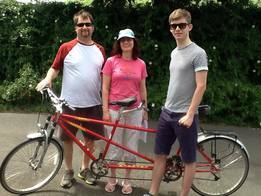 Scott and his parents collected our Dursley based Mission Duet tandem at the start of July 2017. They plan to ride it along the Strawberry Line. Click here for details of other Borrowers.